For the fun of open-air driving, but with some protection from the sun, the Sun Bonnet from Mopar provides just the right balance of exposure and shade. 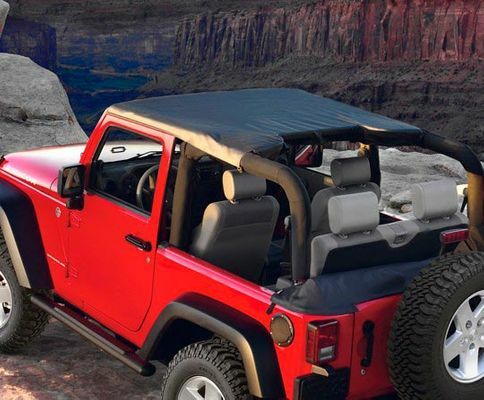 The Sun Bonnet preserves the open-air feel of driving your Wrangler with the top down, but still provides protection from the sun for your passengers. It is made of materials that match your existing soft top and resist fading. Note: For the 2010 to 2018 Wrangler, you must remove the door surrounds and use the hardware in the kit. 3-ply premium material. Available in black for 2 Door or 4 Door. Please select model and top type above. Arrived on time and is as described. Much less expensive than the dealer. I haven't used yet so I can't speak to installation and function. ConsThe soft top model fits in side plastic Mopar hardware for the soft top. The hard top model fits in metal brackets you have to install (easy) with a lot a straps. Just wish I knew the difference as I have both. So far so good! Easy to install. I have had my Mopar Sun Bonnet for a few weeks, but it has only been on my jeep for a week. It fits snug and there is only a sliver of a gab between the edge of the cover and the door. I chose the sun bonnet because it works for the hard top version on my 2013 Wrangler Unlimited without needing to by extra items like the windshield rail and door surrounds. Haven't had any rain yet, but some is due this week. I actual forget I have it on because there in no flapping sound. My reason for purchasing was to have something easy to put on and take off. I want to leave the top on during the week and pull it off on the weekends. ConsThere is a wrinkle in the material on the passenger side, but nothing too severe. I think it's caused by how the top is strapped on and don't believe it is fixable.